Bacon & gruyere bread pudding! 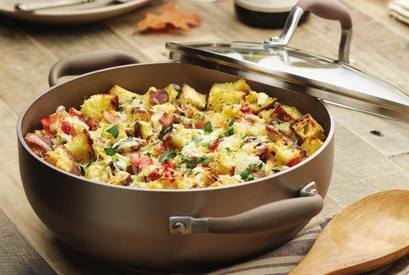 This savory bread pudding is a great winter dish for a crowd. It can be made ahead of time for convenience and served at room temperature or warmed up for 15 minutes in the oven at 350˚F. You can serve smaller portions for a side item or large portions for a main course. Packed with savory flavor, this bread pudding is perfect for a holiday brunch, easy lunch or casual holiday dinner.